Mike Booth has created this special collection of original songs with music by James Asher. Combining spoken word, rap and poetry they paint a highly original vision and commentary on a series of topics, and questions on themes from current, sociological and political through to philosophical. Stylistically fresh, they are delivered with inimitable character and attitude. Musically there are several contemporary influences, and are mostly rhythmic and energetic, along with some other gentler moments. It also includes Mike’s unique version of the classic song Over the Rainbow. Since 1984 and my meeting with Vicky Wall and Mike Booth, Aura-Soma has always been a great positive influence and encouragement to my creative abilities. 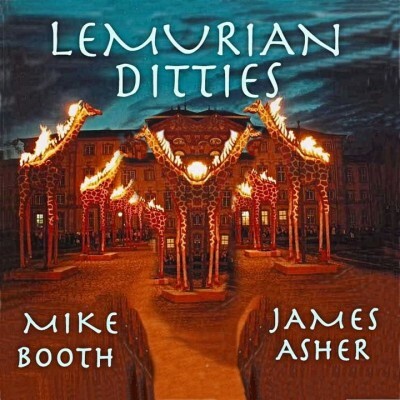 Mike and I have long discussed the idea of the Lemurian Ditties idea, which he had from some years back indicated would be the appropriate successor to the Atlantean Chants album released in 2001. Somehow the timing seemed right this year and in a relative short space of time we have created what feels like a fresh, innovative and energetic collection of tracks. Lemurian Ditties makes reference to rap as a genre, but includes poetry and music in combination in other ways. Its inability to sit neatly in any specific musical category is a strong testament to the idea that creativity is fully alive in the process of its creation, and it has been illuminating and fun as ever to help Mike birth another extraordinary project. We have been joined by two members of the Swiss Aura-Soma family Lukas and Denise Merki on Mike’s amazing reinterpretation of the famous ‘Over the Rainbow’ song from the Wizard of Oz. The concept of rainbows has always linked back strongly to Vicky, for whom they were a significant indication of a certain kind of smile from the universe. During the 72 Angels Course held at Dev-Aura in February this year, it was stunning to see an actual rainbow about half an hour after the one of the first plays of the version on this CD! Also on this CD we were joined by Haythen Mohamed, a virtuosic and extraordinary young guitarist, whom Erik Pelham discovered and invited to perform at the Flower Essence Conference, held in Dev-Aura in March. Haythen’s percussive and lyrical style adds much to the musicality of the tracks, and it is a privilege to include his playing. Credits : All tracks written by Mike Booth and James Asher, except What is Love? by Mike Booth, Terah Cox and James Asher. Over the Rainbow by Harold Arlen, E.Y. Harburg, arranged by James Asher. Track 5 features poem by Rumi and track 11 features poem by Krishnamurti. Recorded at Starfield Studios, Eastbourne, East Sussex, 2011. Published by Radiant Music. Track 2 – Earthgrid Shift contains a sample from ‘Emerald’ by James Asher and Madeleine Doherty from the CD Colours of Trance. This track benefited especially from the creative input of Grahame Gerrard who in the studio with Mike at the time helped co-create the unique original quality of the track. Grahame sadly died on April 7th 2011. His amazing aptitude to understand and creatively apply technology were unparalleled, and his expertise was remarkable. His brilliant mind, warm and soulful friendship, and great sense of humour are and will remain sorely missed. Therefore Mike and James would like to dedicate this album to his memory.